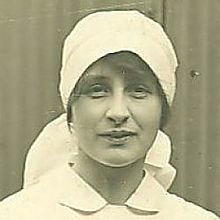 Vera Britten in her V.A.D. uniform. Last January, Emma recorded composer Roland Bouman’s setting of Vera Brittain’s “Perhaps.” The poem is an elegy for her fiancé, Roland Leighton, who died of a sniper wound in Hébuterne, Northern France, on 23rdDecember 2015, aged just twenty. The Dutch radio programme “Music and Poetry” interviewed Emma and Roland (in Dutch) and broadcast the recording. It is possible to listen through this link.